Our institutions such as hospitals, schools elder care facilities and even high end tenant building looking to insure their patients/clients safety can add a layer of recognition to the security already in place. Tenants of high end apartment and condo facilities feel much better knowing they are registered in the system and can be seen walking into the facility and immediately identified as a priority for the door man or watchman that may be assigned to the facility. Hospitals – Hospital administrators can use First Line Facial Recognition to protect emergency room entrances particularly in areas with high crime, maternity wards, animal research areas, and nuclear med areas. Currently under exploration is the use of our system for gaining entrance into surgical areas for the doctors’ ease of movement. 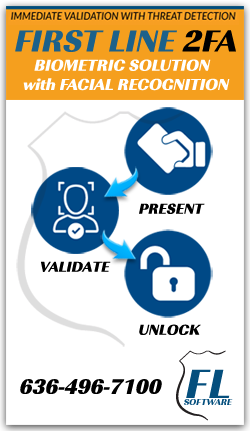 In addition, there are often two levels of security authentication required and the proprietary First Line Facial Recognition software is proven to be a user-friendly, non-intrusive answer to this requirement. Schools – Controlling and monitoring who is allowed inside the building is one of the main concerns that educators address. School administrators use the system as threat detection against expelled violent students, hostile parents (biggest pain point for them) and those going through child custody issues. First Line Facial Recognition also serves as an effective badging process as students leave the school during the day. Additionally, first responders can be entered into the system as “authorized” for immediate entry in case of an emergency. Children’s Venues – One of the biggest fears with children venues is potential predators that threaten the health and welfare of the children. Venues such as zoos, amusement parks and local libraries can use the product as threat detection for child predators. Known threats can be entered into the database, and the system then monitors these potential threats at strategic entry points. Nursing Homes – First Line Facial Recognition creates a convenient way for families to enter and move throughout the facility instead of laborious and often ineffective coding. Ease of movement in the facility for staff is important as they often have their hands full as they walk. The system can also be used to protect drug rooms to monitor who enters as all are videotaped and as a badging tool for all regular contractors. Additionally, the system can operate as access control for individual rooms in high-end facilities. High End Apartments/Condos – For tenants of high end apartment and condo facilities, First Line Facial Recognition allows them to be seen walking into the facility and immediately identified as a priority for the door man or watchman. The system provides the concierge support that property management groups require and can be set up to provide access without cards and fobs to the gym, garages, pools and rooftops. The hands-free nature of First Line Facial Recognition allows tenants to access areas without having to even put down their groceries, coffee or suitcases. The system doubles as threat detection for vagrants, thieves and other unwanted intruders. Authorized visitors such as contractors can be preset for secondary authorization as well.